Low Carb Diet News - Tag Archive for "Appetite"
Instead, according to scientific studies, artificial sweeteners can increase appetite and maintain cravings for sweet food. This could be because the body increases insulin secretion in anticipation that the sugar will appear in the blood. When this doesn’t happen, blood sugar drops and hunger increases. Whether this chain of events really take place is somewhat unclear (although something odd happened when I tested Pepsi Max). 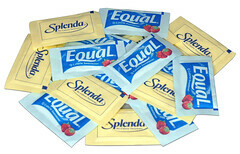 Nevertheless, artificial sweeteners can maintain an addiction to sweets and lead to snack cravings. And the long term effects of consuming artificial sweeteners are unknown. How to lose weight: Avoid fruit!